The Landscapes of Sanford R. Gifford, a major retrospective of the innovative paintings by 19th-century American landscape painter Sanford R. Gifford (1823-1880), who is known as a master of light and atmospheric detail, was presented in the West Building of the National Gallery of Art from June 27 through September 26, 2004. The first major exhibition of Gifford's work in more than 30 years featured 72 paintings that illustrate the artist's travels in North America, Europe, and the Middle East. The exhibition was organized by the National Gallery of Art, Washington, and The Metropolitan Museum of Art, New York. The exhibition was on view at the Metropolitan Museum of Art from October 7, 2003, to February 8, 2004, and at the Amon Carter Museum, Fort Worth, from March 6 to May 16, 2004.
and View from South Mountain in the Catskills (1873), on loan from the St. Johnsbury Athenaeum, St. Johnsbury, Vermont. Organized chronologically, with groupings of related works, the exhibition included many of Gifford's "chief pictures." To give insight into the artist's remarkable creativity, the exhibition also included a selection of his mid-size canvases, as well as smaller, cabinet-size sketches, studies, and reduced versions of major paintings. 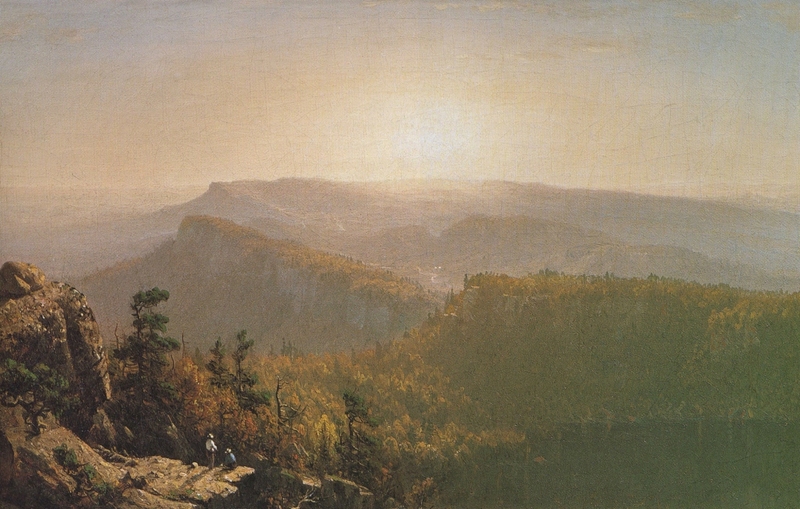 Some of the mid-size paintings, such as The Shawangunk Mountains (1864), were chosen because of their relationship to larger works that remain unlocated, while others offer clues to Gifford's process of developing the major pictures. Major works in the exhibition included Lake Nemi (1856-1857), the first important painting in which the artist employed what became his trademark--the setting sun as a radiant focal point, its light a tonal unifier of his compositions. 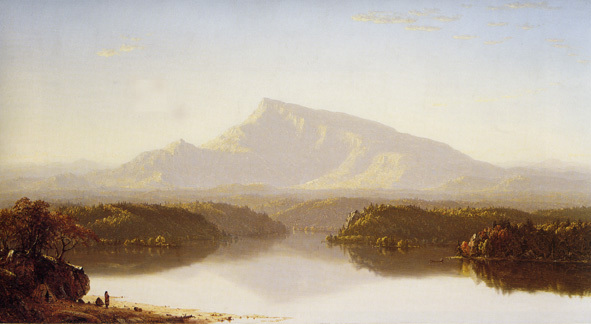 Exhibited at the National Academy of Design in New York in 1858, the painting helped establish Gifford as one of the premier representatives of painters who would eventually be known as the Hudson River School. The artist's fascination with the transfiguring effects of light on the natural landscape is apparent in works such as A Gorge in the Mountains (Kauterskill Clove) (1862) in which the radiant afternoon sun hovers over an idyllic mountain valley. The work is presented in the exhibition with several related oil sketches. and The Artist Sketching at Mount Desert, Maine (1864-1865), the last notable for its inclusion of an artist (most likely Gifford) in the scene. The exhibition also included a number of paintings inspired by the artist's Civil War experiences, such as the melancholy landscape, Hunter Mountain, Twilight (1866). Nearly a quarter of the exhibition was devoted to works inspired by Gifford's travels abroad, including Siout, Egypt (1874), Isola Bella in Lago Maggiore (1871), and The Ruins of the Parthenon (1880). Born and raised in the center of the Hudson River Valley, Sanford Gifford came from a family that supported and encouraged his artistic leanings, and whose prosperity meant he could pursue painting without financial worries. Gifford began training in New York City to be a portrait painter, but--inspired by the work of the American landscapist Thomas Cole--turned to landscape painting. Gifford spent the summer of 1846 touring and sketching in the Catskill and Berkshire mountains. By 1847, he had begun to show his work at the American Art-Union and the National Academy of Design in New York, where he was elected an associate in 1850 and an academician in 1854. In 1855, Gifford traveled to Europe, where he spent two-and-a-half years visiting the great repositories of art and sketching scenery in England, Scotland, France, the Low Countries, Germany, Switzerland, and Italy. In England, he admired the color and light in the paintings of J.M.W. Turner, and discussed his work with the critic John Ruskin. Gifford was also impressed by the work of the French landscape painters of the Barbizon school, but wrote in his journal of the dangers of surrendering to a particular method or school of painting, lest they "usurp the place of Nature." When Gifford returned to the United States in 1857, he took up quarters in the new Tenth Street Studio Building in New York City but left it nearly every summer to sketch in the countryside. Favorite settings in this period were the Catskills, the Adirondacks, the Green Mountains in Vermont, the White Mountains in New Hampshire, and various locales in Maine and Nova Scotia. During the early years of the Civil War, Gifford served in New York's renowned Seventh Regiment. In 1868 Gifford went abroad for a second and last time, spending more than a year traveling in Europe and the Middle East. Along with notable artists and civic leaders of the day, he was a founder of The Metropolitan Museum of Art in 1870. After his death in 1880, he was honored with the Metropolitan's first monographic retrospective and a memorial catalogue of his known pictures. The exhibition was organized by Franklin Kelly, senior curator of American and British paintings, National Gallery of Art, and Kevin J. Avery, associate curator, with the assistance of Claire A. Conway, research assistant, department of American paintings and sculpture, The Metropolitan Museum of Art, New York. The exhibition was accompanied by a fully illustrated catalogue, which featured essays by the exhibition's co-curators Kevin Avery and Franklin Kelly, and by Eleanor Jones Harvey, Luce Center Curator, Smithsonian American Art Museum, and Heidi Applegate, doctoral candidate, Columbia University. Published by the Metropolitan Museum of Art and distributed by Yale University Press, the catalogue is 200 pp., 148 black & white and 73 color illustrations. Cézanne in Provence--on view January 29 through May 7, 2006, in the West Building of the National Gallery of Art in Washington, and June 9 through September 17, 2006, at the newly renovated Musée Granet in Aix-en-Provence--was the principal international exhibition marking 2006 as the centenary of the death of Paul Cézanne (1839-1906). A key figure in the impressionist and post-impressionist movements, he is often seen as the father of modern art. This exhibition, by focusing on the works Cézanne painted in and around his native Aix-en-Provence, celebrated the landscape and the rich associations it had for him. Approximately 100 of Cézanne’s greatest oil paintings and watercolors demonstrated his intense, emotional engagement with the countryside of his birthplace, where he painted some of his most compelling landscapes, penetrating portraits of family members, and the monumental Bathers from the National Gallery, London. Works depicting such scenes as Cézanne’s family home of Jas de Bouffan, Mont Sainte-Victoire, the Mediterranean coast at L’Estaque, the dramatic quarry at Bibémus, and the Château Noir will come from public and private collections throughout Europe and the United States. The exhibition was organized by the National Gallery of Art, Washington, the Musée Granet, and the Communauté du Pays d’Aix, Aix-en-Provence, and the Réunion des musées nationaux, Paris (French National Museums Organization). The exhibition also launched Cézanne 2006 in the United States and France, where Aix-en-Provence celebrated the centenary with numerous events, including the reopening of the Musée Granet, one of France’s top regional museums, and the opening to the public of several key sites including the Jas de Bouffan and Cézanne’s work cabin in the Bibémus quarry, as well as the famous studio at Les Lauves, newly restored to its original state. Provence nurtured the life and art of Paul Cézanne (1839–1906) like no other place. In the distinctive countryside around his native Aix-en-Provence, the pays d'Aix, he found the motifs, rich in natural beauty but also in emotive associations, that have since become synonymous with his art. Cézanne created some of his most compelling images in the solitude of Provence. They include not only landscapes painted outdoors but also portraits, still lifes, and imaginary scenes of bathers that he executed in the studios he occupied in and around Aix. The Master of Aix, as Cézanne came to be known during his lifetime, drew on his birthplace for the inspiration that set him on his path as an artist. Throughout the sometimes arduous progression of his career, Provence—more specifically the countryside around Aix—remained a constant source of strength in his struggle to master the means of his artistic expression. Other artists had come to paint the Provençal landscape before him, but Cézanne made this corner of Provence uniquely his own, adopting motifs and views that convey a powerful sense of place. Private Collection, Courtesy of Wildenstein & Co., New York This is one of the first Provençal paintings in which Cézanne applied the bright palette and free handling he had developed in Paris with Pissarro and the impressionists during the 1870s. The work was most likely executed in the summer of 1874, soon after Cézanne had returned home from Paris. He had written his parents that he hoped his father would finance a long stay at home in Aix: "I shall be very happy to work in the South, where the views offer so many opportunities for my painting." "Grant Wood's Studio: Birthplace of 'American Gothic'" appeared at the Smithsonian American Art Museum's Renwick Gallery, March 10, 2006 - July 16, 2006. This was the only presentation besides the Cedar Rapids Museum of Art. Jane Milosch, curator at the Renwick Gallery, was the curator of the exhibition. The exhibition coincided with the renovation of the artist's historic studio in Cedar Rapids, Iowa, known as "5 Turner Alley," where he lived and worked from 1924 to 1935. Wood converted the loft of this turn-of-the-century carriage house into a showcase for his decorative arts work and a backdrop for some of his most famous paintings. The exhibition featured works from the collection of the Cedar Rapids Museum of Art, studio artifacts and heirlooms that served as props, as well as significant loans from other museums and private collections that rarely travel. Together these works helped to re-create Wood's studio and demonstrated the importance of craft in the development of the artist's work. This exhibition of approximately 160 works by artist Grant Wood (1891-1942) placed his decorative arts and design work within the larger context of his better-known paintings, drawings, and prints. Born in Anamosa, Iowa, in 1892, Grant Wood spent his career painting the landscapes and people of the American Midwest. Wood studied at the Art Institute in 1912 and made several trips to Europe in the 1920s. He went to Munich in 1928 to supervise the manufacture of a stained-glass window he had designed. Inspired by early Flemish paintings in museums he visited, Wood developed and refined his style, characterized by carefully drawn details and clear, strong lines. He was a member of a group of artists known as regionalists, who were part of the American Scene movement of the 1930s. Wood and other artists such as John Steuart Curry and Thomas Hart Benton rejected the modern movements of their European colleagues, and instead looked nostalgically to America's past and rural life for inspiration. Their works reflect the strong nationalist spirit of this period in American history. The interest in specific regions of the country also found expression in the fiction of William Faulkner and John Steinbeck, as well as government programs that encouraged local arts and crafts traditions. Wood not only depicted the farms of his Iowa childhood in his work, but he also painted the farmers, celebrating their enduring, virtuous, and heroic spirit. He could also view them with wit, as in his most famous painting, American Gothic. 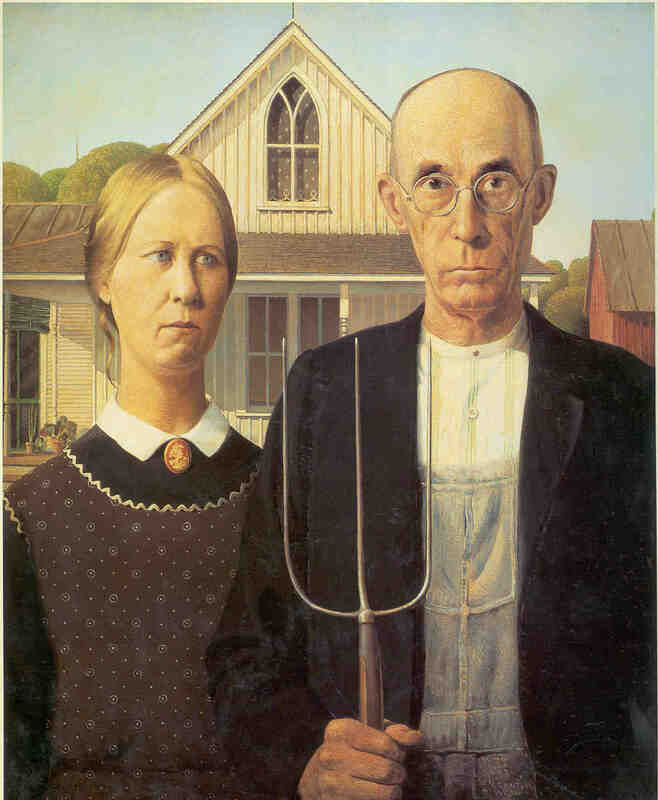 That portrayal of a farmer and his wife won him national recognition and a bronze medal in 1930 from the Art Institute of Chicago, where it now hangs. The artist died in Iowa City in 1942. 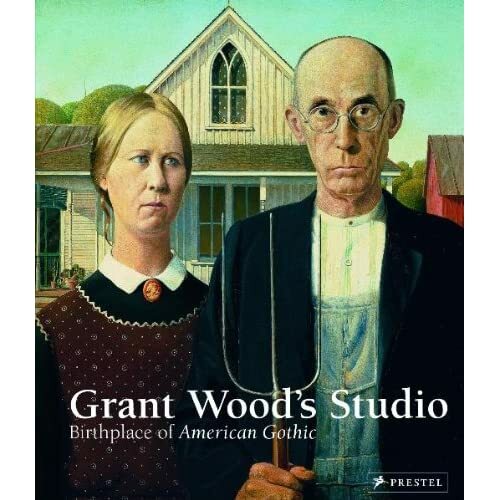 "Grant Wood's Studio: Birthplace of 'American Gothic,' " published by Prestel, contains essays by Jane Milosch; Wanda M. Corn, Robert and Ruth Halperin Professor in art history at Stanford University; James M. Dennis, professor emeritus of art history at the University of Wisconsin, Madison; and Joni Kinsey, associate professor of art history at the University of Iowa, Iowa City. The National Gallery of Art was the only U.S. venue for the first large-scale survey of French genre painting--scenes from daily life, real and imagined--by such 18th-century masters as Jean-Antoine Watteau, Jean-Honoré Fragonard, Jean-Baptiste-Siméon Chardin, Jean-Baptiste Greuze, François Boucher, and Louis-Léopold Boilly. On view in the West Building October 12, 2003 through January 11, 2004, The Age of Watteau, Chardin, and Fragonard: Masterpieces of French Genre Painting included works never before exhibited in this country and offered an unprecedented opportunity to see some of these artists’ finest works in proximity to each other. The 18th century was a period of vast political, economic, and social change in France, as the moral principles of the Enlightenment took hold and radically transformed the structures of society. Mirroring the contemporary realities of French culture, French genre paintings were part of the great ideological shift in thought and art, away from the religious and monarchical values of 17th-century French society towards the ideals of the Enlightenment. Influenced by 17th-century Dutch and Flemish art, French genre painting demonstrated a compelling vitality, ultimately surpassing that of the officially sanctioned history painting that prevailed in France at the beginning of the 18th century. The exhibition was organized thematically and chronologically. 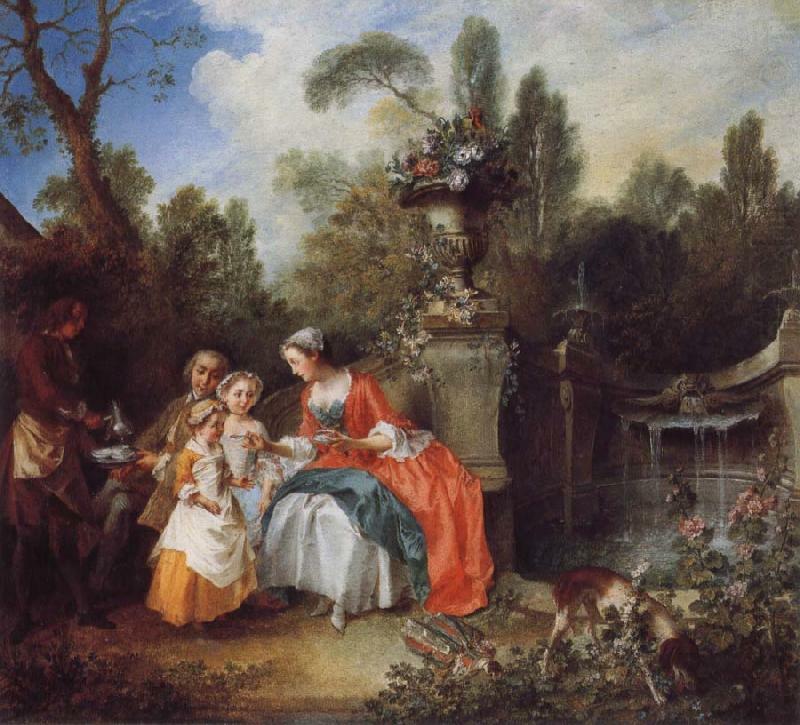 Its more than 100 master works--some on loan from France, Germany, England, and Russia--span the entire 18th century, from the last years of Louis XIV to the French Revolution, and reveal Enlightenment ideals of the family, the education of children, the importance of love, and the sheer delight in painting. 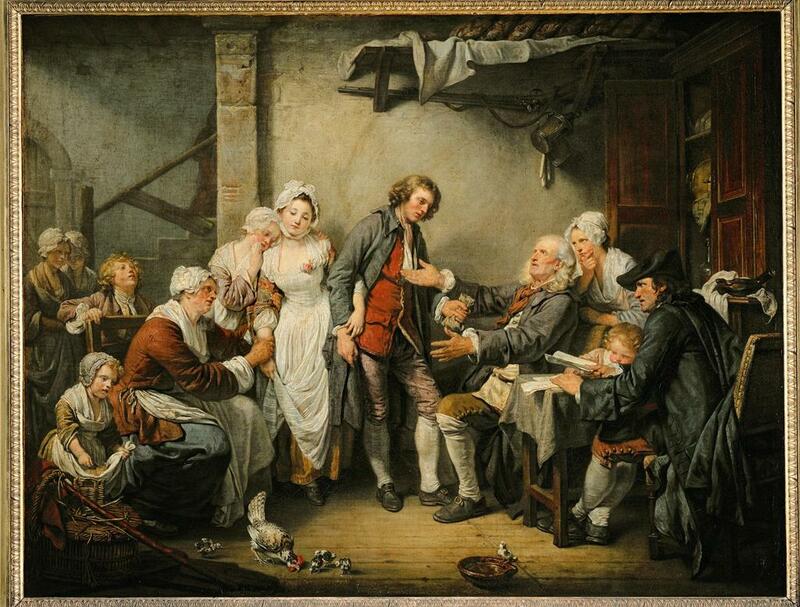 and such hugely popular family dramas as Jean-Baptiste Greuze’s (1725 -1805) The Marriage Contract (1761). and Louis-Léopold Boilly’s (1761-1845) scenes of contemporary Paris. Philip Conisbee, senior curator of European paintings and curator of French paintings at the National Gallery of Art, was the curator of the Washington exhibition, in collaboration with Colin B. Bailey, chief curator, The Frick Collection, and former chief curator, National Gallery of Canada; and Thomas W. Gaehtgens, director, Deutsches Forum für Kunstgeschichte, Paris, and professor at the Freie Universität Berlin. The richly illustrated exhibition catalogue, produced by the National Gallery of Canada, Ottawa, includes a curators' preface; essays by Colin Bailey, Thomas Gaehtgens, Barbara Gaehtgens, Marianne Roland Michel, and Martin Schieder; entries on 113 works; and a complete listing of genre paintings shown at the Paris Salons from 1699 to 1789. Complementing the exhibition Abstract Expressionist New York at MoMA from October 3, 2010-April 25, 2011 was the installation On to Pop, which showcased a selection of Pop Art highlights from the Museum’s permanent collection. In 1955, the influential critic Clement Greenberg published the essay “American-type painting,” which hailed the abstract, non-referential imagery and monumental scale of Abstract Expressionist canvases as the most advanced form of painting then practiced. That same year, the 25-year-old artist Jasper Johns painted an American flag. This familiar, iconic emblem belonged to the world of everyday things. Rendered in wax encaustic and augmented with collage, the work’s tactile, painterly surface and allover compositional structure engaged the visual language of Abstract Expressionism while it pointed in a new direction. and Roy Lichtenstein’s Drowning Girl. Collectively these works helped to define American Pop Art, a very different kind of “American-type” painting, which by the late 1960s had eclipsed Abstract Expressionism’s dominance on the New York scene. On to Pop, was organized by Anne Umland, Curator, Department of Painting and Sculpture. Drawn entirely from the collection of The Museum of Modern Art, Abstract Expressionist New York traced the development of Abstract Expressionism from its auspicious beginnings in the 1940s to its seasoned maturity in the 1960s. The exhibition was on view at MoMA from October 3, 2010-April 25, 2011. Marking the Museum’s largest and most comprehensive presentation of Abstract Expressionist art, this wide-ranging survey brings together some 250 works across a variety of mediums, including painting, sculpture, drawings, prints, photographs, and film. Masterpieces by artists such as Jackson Pollock, Mark Rothko, Barnett Newman, Robert Motherwell, Arshile Gorky, Lee Krasner, Willem de Kooning, David Smith, and Joan Mitchell were joined by lesser-seen but revelatory works by artists who developed independent voices within Abstract Expressionism. In addition to providing a fresh look at scores of works of art that have not been seen together in half a century, the exhibition also offered a selection of images and documentary material from The Museum of Modern Art Archives, which illustrated the linked histories of Abstract Expressionism, MoMA, and New York City during this pivotal moment in modern art. Abstract Expressionist New York was on view throughout the Museum, spanning 25,000 square feet of gallery space, including the entire fourth-floor painting and sculpture galleries as well as galleries on the second and third floors. Abstract Expressionist New York was organized by Ann Temkin, The Marie-Josée and Henry Kravis Chief Curator of Painting and Sculpture; Jodi Hauptman, Curator, Department of Drawings; Sarah Suzuki, The Sue and Eugene Mercy, Jr., Assistant Curator of Prints and Illustrated Books; Sarah Meister, Curator, Department of Photography; Michelle Elligott, Museum Archivist; Anne Morra, Associate Curator, and Sally Berger, Assistant Curator, Department of Film; and Paulina Pobocha, Curatorial Assistant, Department of Painting and Sculpture. 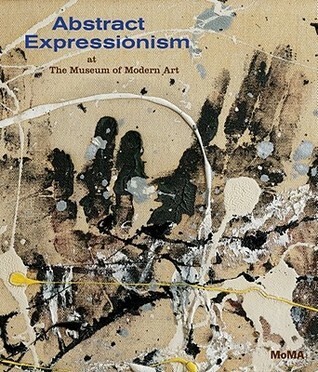 Abstract Expressionism ranks among the movements most closely associated with The Museum of Modern Art. From the moment of its founding, the Museum honored, as part of its mandate, a commitment to art by Americans as well as by Europeans. Under the leadership of founding director Alfred H. Barr, Jr., its initial pursuit of works by Abstract Expressionist artists took place within the context of a wide-ranging program of acquisitions and exhibitions of work by artists living in the United States. Built on this strong foundation, the Museum’s present-day collection of Abstract Expressionism—unrivalled in its breadth and depth—was formed over the course of many decades with the sustained support of the Museum’s curators, trustees, and often the artists themselves. Subtitled The Big Picture, this installation of 100 Abstract Expressionist paintings and a rich selection of some 60 sculptures, drawings, prints, and photographs, occupies the entire fourth floor of the Museum and chronicles the era of Abstract Expressionism. The movement drew together a host of artists with greatly varying stylistic approaches, but with a common commitment to the power of an abstract art that could express personal convictions and profound human values. Organized in a loose chronology, intermittently interrupted by monographic galleries that allow for the in-depth study of an individual artist’s practice, the installation opened with a selection of paintings and drawings that attest to the acutely self-conscious sense of new beginnings present in the work of individuals such as Jackson Pollock and Mark Rothko. In the immediate aftermath of World War II, they and their peers—not yet a cohesive group—created imagery that evoked primitive man or ancient myth, and conjured an aquatic or geological pre-human world. 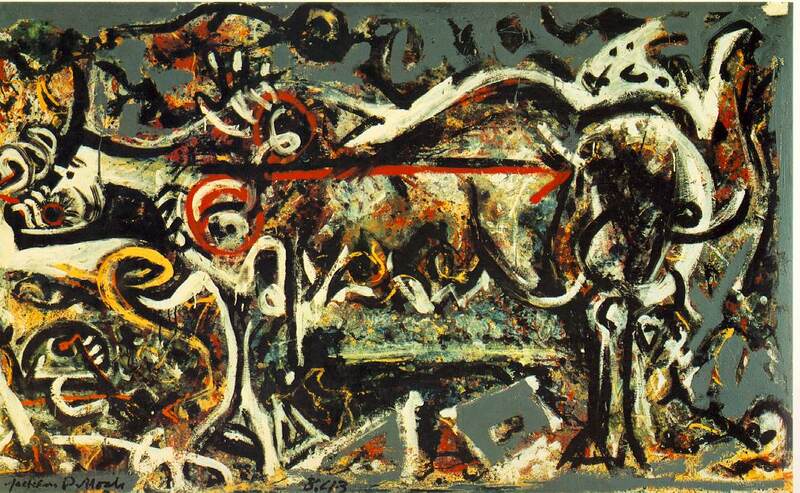 Upon entering the galleries, visitors were greeted by Jackson Pollock’s The She-Wolf (1943), which was featured in the artist’s first solo exhibition, in 1943, and was the first work by Pollock to enter a museum collection when MoMA acquired it the following year. Made before Pollock developed his signature “drip” style, the canvas shows that a free-form abstraction and an unfettered play of materials were already parts of his process. Also on view was Mark Rothko’s Slow Swirl at the Edge of the Sea (1944), a canvas picturing two creatures floating between sea and sky, surrounded by arabesques, spirals, and stripes that betrays the influence of Surrealism on Rothko’s early work. A monographic gallery was devoted to the work of Barnett Newman included Onement, I (1952), which the artist later identified as his breakthrough painting. Modest in size, it consists of a monochromatic background divided in half by a vertical band, or “zip” as the artist later called it. Every successive painting by Newman, as seen in the seven works in this gallery, features this particular compositional motif, although their formal and emotional differences are apparent. The scale and proportions of the paintings, as well as their palette and brushwork, vary from work to work, as do the number of zips and their location in the field of color. At the other end of the spectrum from this relatively small canvas is Vir Heroicus Sublimis (1950-51), an 18-foot-wide, vibrant red expanse that was Newman’s largest painting at the time of its creation. The distinctive materials, techniques, and approaches developed and practiced by the Abstract Expressionists can be seen in a number of other works from the late 1940s and early 1950s. For Painting (1948), Willem de Kooning used oil and enamel sign paint to create a densely packed painting in which the paint drips, bleeds, congeals, or dissolves into delicate streaks. 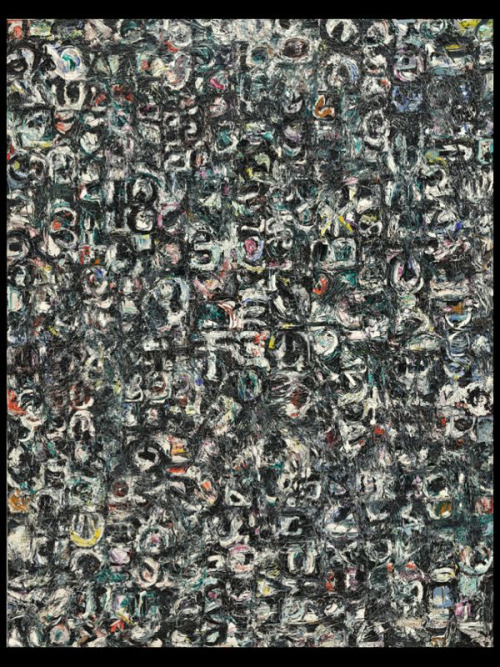 Lee Krasner’s Untitled (1949) shows that she applied thick paint—sometimes directly from the tube—in rhythmic and repetitive strokes, giving equal attention to every inch of the canvas and creating an allover composition. and Adolph Gottlieb, in Man Looking at Woman (1949), distributed imagery evoking the alphabet and hieroglyphics evenly across their canvases. 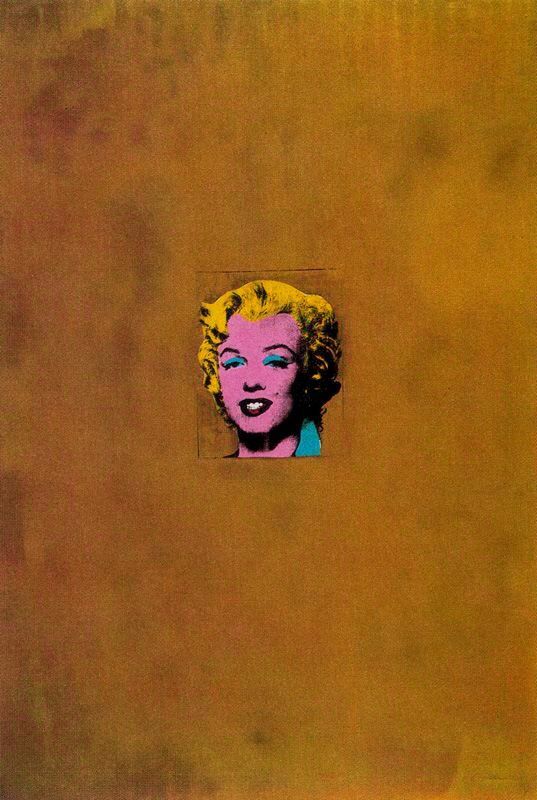 and Number 1A, 1948 (1948), the first drip painting to enter MoMA’s collection (in 1950). 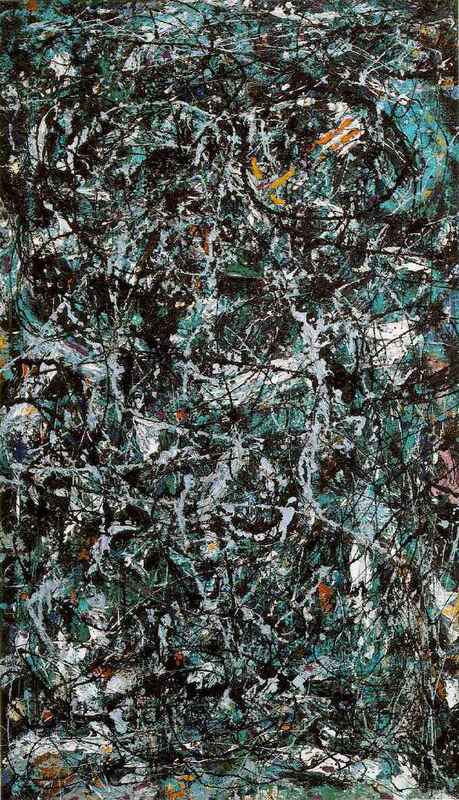 For One: Number 31, 1950 (1950), a masterpiece of the drip technique and one of Pollock’s largest paintings (8' 10" x 17' 5 5/8" [269.5 x 530.8 cm]), the artist laid the canvas on the floor of his studio and poured, dribbled, and flicked enamel paint onto the surface, sometimes straight from the can, or with sticks and stiffened brushes. The density of interlacing liquid threads of paint is balanced and offset by puddles of muted colors and by allover spattering. Eight paintings made by Mark Rothko over a 14-year period were presented in a single gallery. The earliest examples from 1948, such as No. 1 (Untitled), feature variously sized abstract forms caught mid-motion as they shift on the canvas. Beginning in 1950, Rothko’s “classic” style forms as the artist creates a composition from horizontal planes of thinly layered paint and highly modulated color, simplifying the compositional structure of his paintings and arriving at his signature style. No. 10 (1950) is divided horizontally into three dominant planes of blue, yellow, and white that softly and subtly bleed into one another. 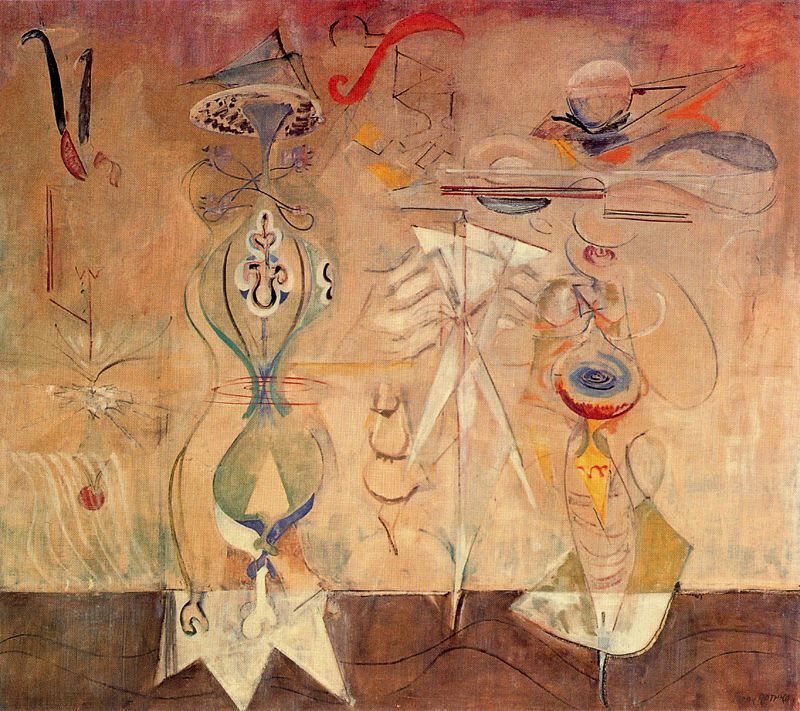 Acquired by MoMA in 1952, it was the first Rothko to enter the Museum’s collection, and was considered so radical that a trustee of the Museum resigned in protest. Published to accompany the exhibition Abstract Expressionist New York, Abstract Expressionism at The Museum of Modern Art presents a selection of more than 100 paintings, sculptures, prints, drawings, and photographs, drawn entirely from the Museum’s vast holdings of works from this transformative period in art history. An essay by Ann Temkin, The Marie-Josée and Henry Kravis Chief Curator of Painting and Sculpture, traces the Museum’s close relationship with the movement, from Abstract Expressionism’s beginnings in the 1940s through its maturity in the 1960s. A fascinating array of documentary photographs from The Museum of Modern Art Archives illustrates that history, from installation shots of an early Willem de Kooning exhibition to candid photographs of Barnett Newman and Lee Krasner mingling at opening receptions. Abstract Expressionism at The Museum of Modern Art is both a catalogue of highlights from a renowned collection and a portrait of a pivotal era in the history of modern art. 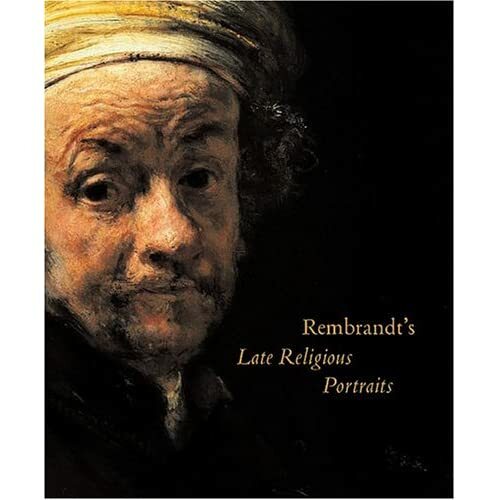 In early 2005, the National Gallery of Art brought together for the first time Rembrandt van Rijn's powerful late portraits of religious figures, executed at a time of great personal turmoil. 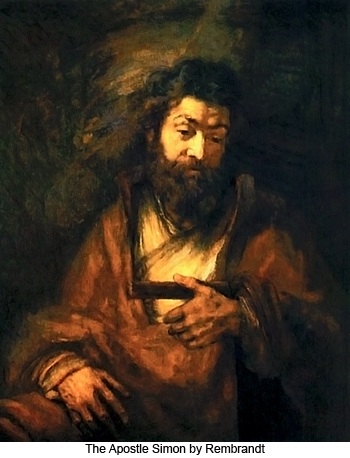 Rembrandt's Late Religious Portraits offered a unique opportunity to explore one of the most fascinating aspects of the Dutch master's artistic career--his brooding and pensive religious images from the late 1650s and early 1660s. 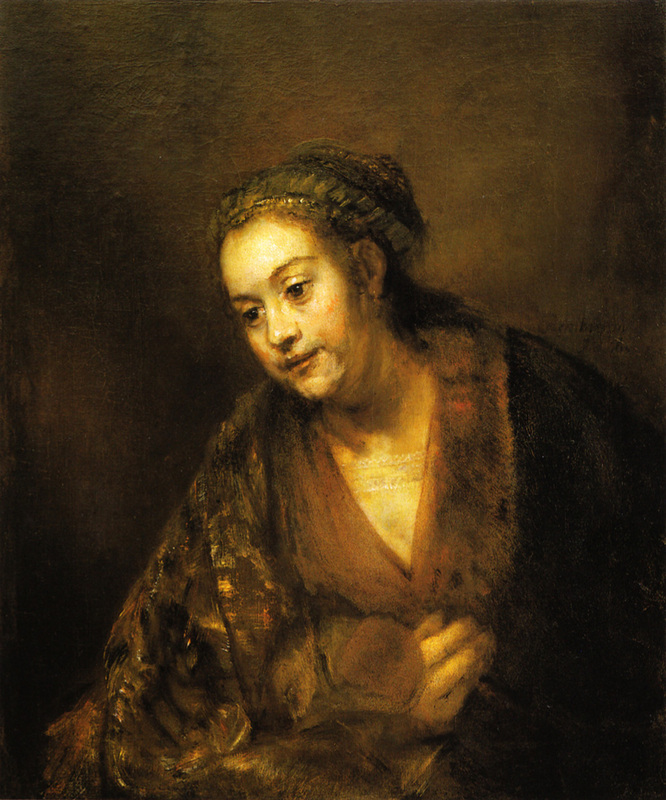 The have raised compelling questions about their creation and purpose, as well as their relationships to each other and to Rembrandt's life and career. The exhibition of 17 paintings gathered from public and private collections in the United States and Europe wason view in the newly reinstalled Dutch galleries of the West Building, January 30 through May 1, 2005, and then traveled to the J. Paul Getty Museum, Los Angeles, where it was on view from June 7 through August 28, 2005.
but there are also representations of the Apostles who devoted their lives to spreading the Gospel, among them Paul, Bartholomew, James, and Simon, and a number of the Evangelists, monks, and later saints. and Rembrandt's last-known portrait of his companion Hendrickeje Stoffel, possibly a depiction of the Sorrowing Virgin, both painted in 1661. The men and women in these powerful images peer out of the dark recesses of dimly-lit interiors, burdened by the weight of their spiritual and emotional concerns. 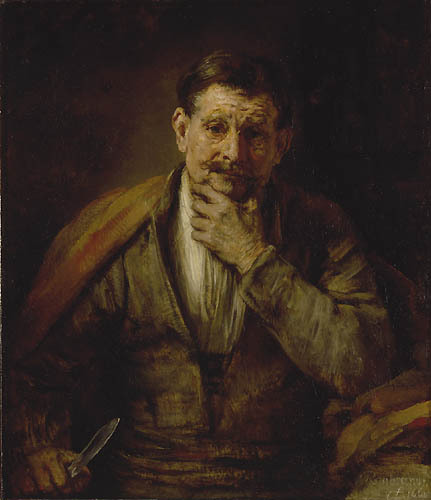 Executed shortly after Rembrandt's financial crises of the mid-1650s, when his expressive style of painting was no longer in demand by Amsterdam's elite, these half-length portrayals reflect Rembrandt's profound understanding of both the human and iconic character of their personalities. He renders not only their physical features but also the state of their psychological being. For more than 80 years scholars have postulated that these religious portraits formed part of a series. 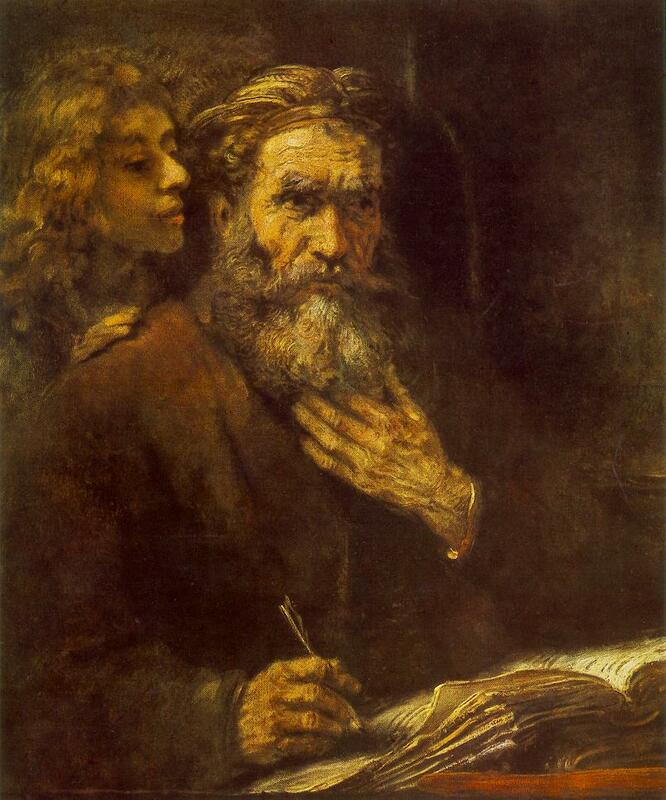 By seeing these paintings together much could have been learned bout Rembrandt's painting techniques, particularly about the myriad of ways he applied his paint and modeled his forms to create his imposing images. The exhibition may also have raised broader issues surrounding the nature of Rembrandt's workshop during this period of his career. The curator of the exhibition was Arthur K. Wheelock Jr., curator of northern baroque painting at the National Gallery of Art since 1984, and curator of such major Gallery exhibitions as Johannes Vermeer (1995–1996) and Jan Steen: Painter and Storyteller (1996). Rembrandt's Late Religious Portraits was accompanied by a lavishly illustrated catalogue published by the National Gallery of Art, Washington, in association with University of Chicago Press. The 152-page exhibition catalogue includes full-color reproductions and entries for each of the paintings in the exhibition written by Wheelock, Peter C. Sutton, Volker Manuth, and Anne T. Woollett. Johanns Vermeer "The Art of Painting"